Dean's Cards recently received a collection of 45 E92 Dockman & Sons cards. These cards are listed online and for sale at DeansCards.com These cards are particularly interesting because they represent such a small portion of the E92 set, but they are the easiest of the four sets to collect. The E92 set is unusual because it was produced by four different companies: The Nadja Caramel Company, The Croft’s Cocoa Company, The Croft’s Candy Company, and the Dockman & Sons Company. Although all of the card fronts are identical, the backs feature one of the four companies’ logos. Some collectors consider these to be four different sets. The artwork on these cards will look similar to other caramel card sets, as is common with this genre of cards. The poses are the same as those found on the E101, E102, and E106 sets. The Nadja set is the largest, featuring 62 cards total. The two Croft’s sets have 50 each and the Dockman & Sons set has only 40. All of the four sets are organized alphabetically by player last name. The Nadja Company was located in St. Louis, but featured players from all of the major league teams. This may be because the Browns and the Cardinals were struggling so mightily. In 1909, both the Browns and Cardinals finished dead last, so the people of St. Louis were probably not terribly interested in their home town teams. Croft’s Was located in Philadelphia, so those two sets are heavy on Athletics and Phillies players. That left Dockman’s, which was located in Baltimore, to publish a set that has very few players from St. Louis or Philadelphia. The Dockman & Sons cards have a variety to the cards that is somewhat refreshing. There are action and portrait shots on solid or natural backgrounds. 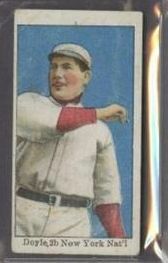 The Dockman’s set does not, however, have the great number of variation cards that the other three manufacturers have in this set. 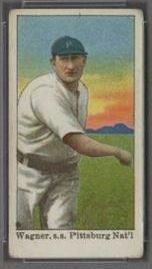 The only variations belong to Honus Wagner and Larry Doyle, who are featured both throwing and batting. We currently have 24 of the 40 possible cards available online.